Veneta Cucine gives its contribution to the 26th edition of Italiacom Open, trial of the Wta Tour. After the great success obtained two years ago, C. Fino + Sons Ltd, with the cooperation of Veneta Cucine, organised the new edition of the Design Thinking Party at the Fino Fuori Salone of Malta. The event was held on Thursday, June 20th, with the participation of the MCAST (Malta College of Arts, Science and Technology). 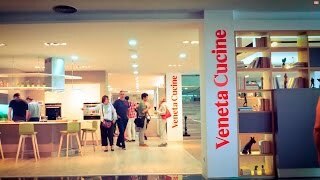 A preview of the opening event for the Veneta Cucine showroom of Moro Arredamenti, which took place in Gallarate on March 21st.